A new division of Russian strategic bombers will soon begin conducting patrols over the Pacific Ocean. The Russian Aerospace Forces are in the process of setting up a new long-range Heavy Bomber Division in Russia’s Far East to patrol the Pacific Ocean inside the Japan-Hawaii-Guam triangle, the Russian Ministry of Defense announced last week, according to local media report. “The formation of the division is almost complete now. It consists of several squadrons of long-distance bombers deployed in the Eastern and Central military districts,” an unnamed senior Russian defense official told Izvestia. The new bomber division will be based at Belaya and Ukrainka, in eastern Siberia. The division will be composed of several dozen Tu-95MS strategic missile bombers and Tu-22M3 long-range bombers. The Tupolev Tu-95MS, an improved variant of the older Tu-95, is a four-engine, long-range, turboprop, strategic bomber that can be armed with a wide range of weapons including stand-off cruise missiles. Russia intends to operate 20 Tu-95MS by the end of 2016. The Tupolev Tu-22M3, also an upgraded variant of an older aircraft developed for the Soviet Air Force, is a supersonic, variable-sweep wing, long-range strategic and maritime strike bomber. Around a hundred Tu-22Ms of all variants are currently in service with the Russian Aerospace Forces. According to media reports, the new division is based on the 6953rd Guards’ Red Banner, Pacific Air Group. During the Cold War, Soviet bombers of the Pacific Air Group patrolled in close vicinity to U.S. military bases in Japan, Guam, and also U.S. naval bases in Hawaii. Russia stopped conducting regular patrols in the 1990s and early 2000s, but has stepped up its military activities in the Pacific Ocean in the last two years. Russian bombers have routinely been patrolling airspace off the coast of Japan since 2014. In 2014, shortly following Russia’s annexation of Crimea and ensuing isolation from the West, including expulsion from the G8 within which Japan is a member, Russian Tu-95 bomber patrols picked up in intensity in the Asia-Pacific region. 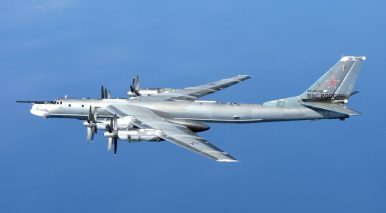 As General Herbert “Hawk” Carlisle, the commander of the U.S. Pacific Air Force, said at the time, the United States noticed that Russian bombers were coming out to airspace near California and, […], circumnavigated Guam. However, as I reported in April, the JASDF reported a decline in the number of times it had to dispatch fighter jets to intercept Russian military aircraft in 2015. Last year, there were 873 overall sorties, with 288 targeting Russian aircraft. In 2014, Japan scrambled jets 943 times, 473 of which were in response to Russian incursions. In October 2015, two Tupolev Tu-142 aircraft, another variant of the Tu-95, flew within one nautical mile of the USS Ronald Reagan, a U.S. aircraft carrier, prompting the dispatch of four F/A-18 Super Hornets from the Reagan to intercept the Russian warplanes. The Russian bombers reportedly violated South Korea’s air-defense identification zone.